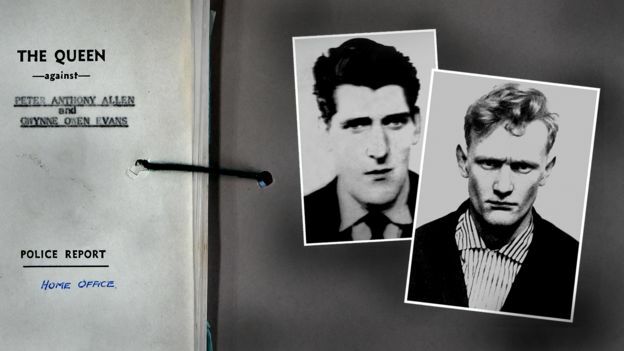 Evans and Allen were the last to suffer capital punishment in England and Wales. The death penalty for murder was abolished in 1965. Any consideration of the case needs to be through the prism of the law as it was at the time. "Where a person kills or is a party to the killing of another, he shall not be convicted of murder if he was suffering from such abnormality of mind (whether arising from a condition of arrested or retarded development of mind or any inherent causes or induced by disease or injury) as substantially impaired his mental responsibility for his acts and omissions in doing or being a party to the killing." The burden of proving diminished responsibility rests on the defence - "On a charge of murder, it shall be for the defence to prove that the person charged is by virtue of this section not liable to be convicted of murder." A defence of diminished responsibility existed at common law in Scotland. Details of this are given in the Scottish Law Commission Report - Report on Insanity and Diminished responsibility - July 2004. Recently, Scotland adopted a statutory defence and abolished the common law on diminished responsibility - see the Criminal Justice and Licensing (Scotland) Act 2010 inserting section 51B into the Criminal Procedure (Scotland) Act 1995. One of the earliest English law cases on diminished responsibility was R v Byrne  2 QB 396,  3 WLR 440 - Court of Criminal Appeal (Lord Parker CJ, Hilbery and Diplock JJ). The murder victim was a young woman whom the appellant had strangled and mutilated. The defence was diminished responsibility. He was convicted and appealed to what was then the Court of Criminal Appeal. The court said that "abnormality of mind" meant a "state of mind so different from that of ordinary human beings that the reasonable man would term it abnormal. "It appears to us to be wide enough to cover the mind's activities in all its aspects, not only the perception of physical acts and matters and the ability to form a rational judgment whether an act is right or wrong, but also the ability to exercise will-power to control physical acts in accordance with that rational judgment." The court continued - "The expression 'mental responsibility for his acts' points to a consideration of the extent to which the accused's mind is answerable for his physical acts which must include a consideration of the extent of his ability to exercise will-power to control his physical acts." Whether the accused was suffering from "abnormality of mind" was a question for the jury taking into account medical and other evidence. The aetiology (cause) of the abnormality of mind was to be determined on expert evidence. Whether the abnormality was such that it substantially impaired mental responsibility for the accused's acts was for the jury to decide as a question of fact and degree. The court noted that it had repeatedly approved directions to juries which followed directions given in Scottish cases where the doctrine of diminished responsibility was part the common law. These directions indicated that such abnormality as 'substantially impairs his mental responsibility' involves a mental state which in popular language ... a jury would regard as amounting to partial insanity or being on the border-line of insanity." The murder committed by Evans and Allen was of Mr John West at his home in Seaton, Cumbria. He was beaten and stabbed. A cosh was found at the scene and the discarded knife was recovered near the road linking Workington to Windermere. It was capital murder because it was committed in the furtherance of theft. See BBC News 18th December 2017. The murder trial, before Ashworth J and a jury, took place at the Crown Court in Manchester from 23rd June to 7th July. At the time it was expected that the trial would take place at Lancaster Assizes but the defence applied to transfer the case to Manchester. Joseph Cantley QC (later Mr Justice Cantley) prosecuted. Evans was defended by Griffith Guthrie Jones QC and Allen by F.J. Nance and R.G. Hamilton. On 20th July, appeals by both men were heard by the Court of Criminal Appeal (Lord Parker CJ, Winn and Widgery JJ). Their appeals were dismissed. Their last hope of avoiding the gallows was the Royal Prerogative of Mercy . On 11th August, the Home Secretary (Rt. 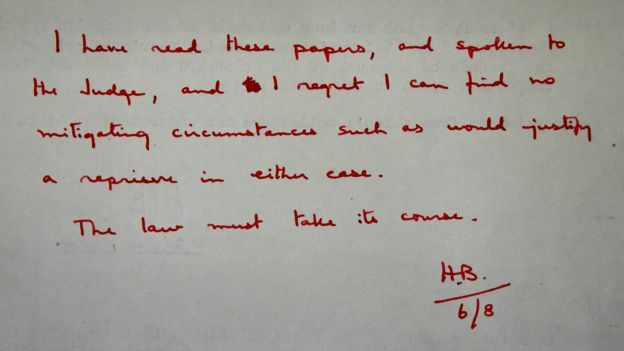 Hon Henry Brooke MP- 1903-1984) decided that there were no grounds to commute the sentences to imprisonment. The men were hanged on 13th August. When the trial started, it was expected that Evans would enter a plea of diminished responsibility which, if successful, would have resulted in a manslaughter conviction. A report from Durham Prison's senior medical officer (Dr P J Waddington) revealed that from a young age Evans had experienced psychological problems and that, as a child, he had been referred to a child guidance clinic because he was “untrustworthy, lacked moral sense, was untruthful and inclined to steal." The medical officer acknowledged that Evans had an "abnormal personality" and thought that most doctors would consider him to have a "psychotic personality, using this term in the broadest sense." Despite this, the medical officer said that he did not believe that this amounted to an “abnormality of mind” that would substantially impair his “mental responsibility for his acts and omissions” - the legal test for diminished responsibility under the Homicide Act 1957 (as it stood at the time). Evans' lawyers obtained a report from Dr G F Duggan Keen, an experienced consultant psychiatrist who stated that Evans had a psychopathic personality but he could not identify a specific condition or disease. Duggan Keen concluded that Evans’ mental responsibility was not “substantially impaired." The psychiatric reports are cursory by modern standards, running to just a few pages and neither the senior medical officer nor Dr Duggan explained why they had come to the conclusion that mental responsibility was not substantially impaired. Dr Tim McInerney, a consultant forensic psychiatrist at the Bethlem Royal hospital in South London, who often gives expert assessments in murder cases said - "If, as an expert now, giving advice to the courts or to a jury as to why I don't support diminished [responsibility] I would have to explain very clearly why I reached that position." At the trial, the prosecution anticipated a diminished responsibility defence and had a further expert (Dr Begg) ready to give evidence that Evans had a "grossly psychopathic personality" but that this did not result in responsibility for Evans' actions being substantially impaired. However, without explanation, the defence chose not to enter a plea of diminished responsibility. We can only speculate as to why this decision was taken. It may be that they thought it would have been unsuccessful in the light of the Court of Criminal Appeal judgment in Byrne regarding "substantial impairment" being something "a jury would regard as amounting to partial insanity or being on the border-line of insanity." From what we know of the short medical reports, it cannot be said that they were entirely supportive to Evans' defence since they came out against a finding that Evans' responsibility was substantially impaired. This BBC News report contains a considerable amount of detail about Evans' life. As a boy he'd been referred to a child guidance clinic - (the now closed Dovenby mental hospital) - because he was "untrustworthy, lacked moral sense, was untruthful, and inclined to steal. Evans confused truth with fantasy and lied continually throughout his life. We also know that he tried to put all the blame for the murder on to Peter Allen. Whether there was, in 1964, a sound basis for a plea of diminished responsibility is debatable. Had it been pleaded, a reasonable jury in those increasingly far away days was very likely to conclude that Evans was fully aware of what he and Allen were doing and that his responsibility for his actions was not substantially impaired and it is on the word substantially that the defence would have depended. Against that is the view of John Cooper QC who is quoted in the BBC News Report - "Cooper has no hesitation in saying that Evans was the victim of a miscarriage of justice. Evans was a vulnerable individual ... And that vulnerable individual was sent into court, into trial without the proper defence put forward for the jury to consider." The proper defence, in his view, would have been a plea of diminished responsibility. And this plea, he argues, would have had a far greater chance of success if there had been a more thorough psychiatric examination. English law was changed with effect from 4th October 2010 by the Coroners and Justice Act 2009 section 52 inserting a new section 2(1) into the Homicide Act 1957. [See the Explanatory Notes - HERE and HERE]. (c) provides an explanation for D's acts and omissions in doing or being a party to the killing. Although the legal definition has changed it will be noted that substantial impairment is required - section 2(1)(b). The word "substantial" is crucial and was interpreted recently by the Supreme Court in R v Golds  UKSC 61. 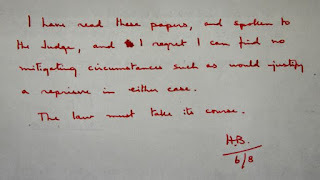 The court's single judgment - delivered by Lord Hughes - carries out out a comprehensive review of the treatment of the expression “substantial impairment” in the context of the diminished responsibility defence in cases from both England and Scotland (from whose common law the English defence was derived). This included the old formulation of the defence in the Homicide Act 1957 before it had been amended by the Coroners and Justice Act 2009. In the authorities reviewed, the expression “substantially impaired” has been consistently treated as a question of degree, and one that should be left to the jury. The cases repeated and re-emphasised, but did not attempt to re-define the statutory expression. However, they did proceed on the assumption that “substantially” in this context meant impairment which was of some importance, or a serious degree of impairment. It was not contemplated in any of the cases considered that it was sufficient that the impairment merely passed triviality." 1. Manchester had a Crown Court from the late 1950s. It was created by the Criminal Justice Administration Act 1956 following a recommendation of the Departmental Committee on a Central Criminal Court for South Lancashire - Cmd. 8955 (1953). The Courts Act 1971 created the Crown Court for England and Wales. 2. The Court of Criminal Appeal lasted from 1908 until 1966. Today appeals from the Crown Court are heard by the Court of Appeal (Criminal Division). 3. The death penalty is not available for ANY offence in the United Kingdom and Protocol 13 to the European Convention on Human Rights abolishes the death penalty. The Murder (Abolition of Death Penalty) Act 1965 abolished the death penalty for murder in Great Britain (the death penalty for murder survived in Northern Ireland until 1973). The Act replaced the penalty of death with a mandatory sentence of imprisonment for life. The Act was introduced to Parliament as a private member's bill by Sydney Silverman MP. The legislation contained a sunset clause, which stated that the Act would expire on 31 July 1970 "unless Parliament by affirmative resolutions of both Houses otherwise determines." This was done in 1969 and the Act was made permanent. The death penalty for Arson in Her Majesty's Dockyards disappeared when the The Dockyards, etc. Protection Act 1772 was repealed by the Criminal Damage Act 1971. See also Crime and Disorder Act 1998 section 36 - abolishing the death penalty for treason and piracy. The Human Rights Act 1998 section 21(5) abolished the death penalty for certain military offences. Section 21(5) was repealed by the Armed Forces Act 2006 but this did NOT restore the death penalty. This publication by the Death Penalty Project is interesting reading.